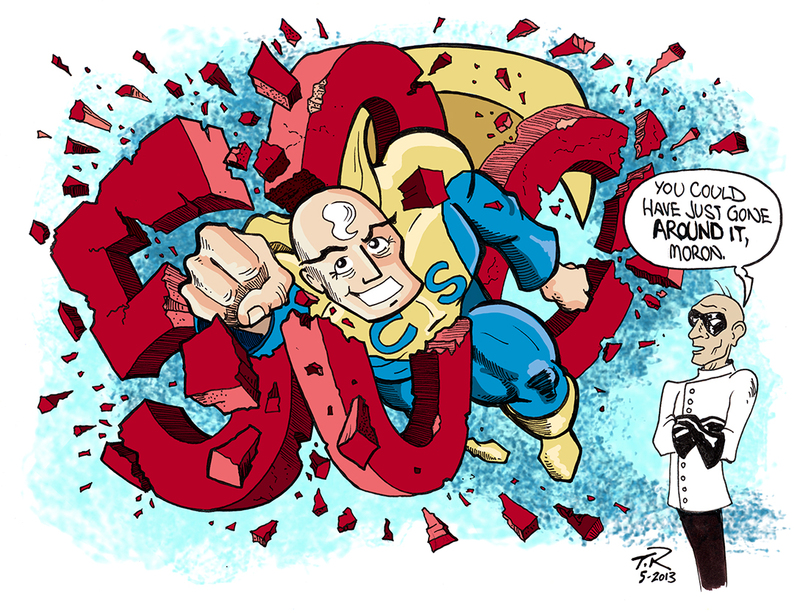 SuperFogeys - Fan Art: SuperFogeys 500 by Tom Racine! I can always count on Tom Racine to bring the funny. I’ve known Tom for years both online and in real life and I can tell you he’s one of the good ones. Through his podcast Tall Tale Radio, Tom has been a big promoter of cartooning and webcomicking and is doing the community a real service by getting out there some voices that would otherwise be hiding behind their pen and mouse. He surprised me with this fan art as his cartooning days are long behind him, but this thing is GREAT. And, like I said, FUNNY. Send me your SuperFogeys Fan Art to bwhheasley (at) gmail (dot) com! My pleasure! Always wanted to draw the good Captain and Dr. R. 500 is a huge milestone for any comic, let alone one as complex and rich in character as SF. You and Marc are hitting it out of the park regularly, and this is my little homage for all the hours of enjoyment you’ve provided!